On June 17th, OASAS General Counsel Robert Kent and Mr. Norwig Debye-Saxinger, President of TCA, presented a kick off webinar regarding the redesign of OASAS Residential Services. 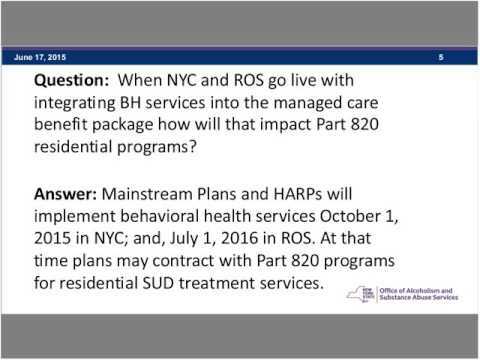 As part of the Medicaid Redesign Team Initiatives, OASAS will bring all adult services into Medicaid managed care in October 2015 for NYC and July 2016 for the rest of the state. Children and Children’s services will begin being enrolled in January 2017 . As part of this move, and in collaboration with residential providers, OASAS is redesigning our residential services. This kick off seminar provided an overview of the residential redesign initiative, addressed questions related to the redesign and informed providers of the overall plan to support programs as they prepare for residential redesign.